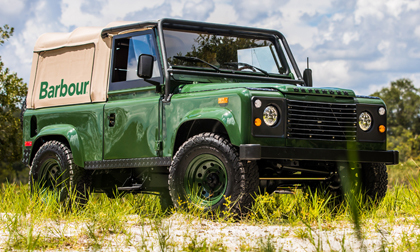 KISSIMMEE, FLA. – OCT. 19, 2017 – Orvis has commissioned a custom Heritage Land Rover in partnership with East Coast Defender (E.C.D.) and Barbour North America, a 123 year old British heritage and lifestyle brand, to be used to promote the company’s new Land Rover Defender Collection offered exclusively through Orvis. “Project Barbour” is a Heritage Edition Defender 90 that combines E.C.D.’s hand-crafted workmanship with the timeless, rugged style that is synonymous with the Barbour name. Orvis will display the SUV at select events along the East Coast through 2018. Guests have a chance to win the fully restored Defender free of charge through The Great Defender Adventure Sweepstakes offered through Orvis. East Coast Defender’s “Project Barbour” started with a Defender 90 and is powered by a rebuilt Rover V-8 engine mated to a 5-speed manual transmission. Interior appointments and exterior features throughout include signature Barbour styling and branding. The front seats and rear benches feature Saddle Leather with Barbour Tartan inserts, paired with Barbour Tartan door pockets with Barbour zip closures. Other interior features include a MOMO Indy steering wheel, Kenwood stereo with Infinity speakers and LED lighting throughout. The custom SUV is finished in Coniston Green with matching colored 16-inch Wolf Steel wheels shod with BFGoodrich All Terrain tires. The tan Rovers North soft top proudly bears the trademark Barbour logo. Participants can enter to win the Defender at a participating Orvis retail store or on-line at orvis.com/defendersweeps. The winner will be chosen at the close of the sweepstakes on Father’s Day 2018. The Defender will be visiting selected Orvis retail stores and other partner locations throughout the U.S. in Fall 2017 and Spring 2018. For a full event listing or to enter for a free chance to win the Defender, visit orvis.com/defendersweeps for more information. As Barbour enters its second century of operations, the company pledges to continue to meet the needs of its customers through growth and new product introductions, while also adhering to the standards of quality established by John Barbour more than 100 years ago. Established in 1894, J. Barbour & Sons is a British company headquartered in South Shields, England. They produce a complete line of lifestyle clothing inspired by the British Countryside most notably waxed cotton and quilted jackets, and a full range of contemporary and classic knitwear, shirts, trousers, headwear and accessories. The Heritage collection draws inspiration from Barbour’s rich archives taking key features from iconic pieces and styling them with a twist to create garments for today. A family-held business, Barbour employs more than 800 people worldwide and owns and operates one factory in South Shields, England. Consumers are invited to call Barbour, Inc., the U.S. subsidiary in Milford, N.H., at 800-338-3474, for a catalog or a name of a local retailer, or visit the Barbour website at www.barbour.com/us. Founded in 1856, Orvis believes the most meaningful experiences are created by sharing the love of nature and being inspired by its endless possibilities. Orvis pioneered the mail order industry in the United States, operates more than 80 retail stores in the U.S. and U.K. and maintains a network of more than 400 dealers worldwide as a trusted source of discovery and adventure in the natural world. Orvis promises to open the door to extraordinary outdoor experiences and to protect nature by committing 5% of pretax profits each year to conservation efforts worldwide.